Promising filly Excelamour (2f Excelebration x Explosive Love, by Rubiton) scored a fast finishing win in the $100,000 Inglis Scone 2YO Classic on Friday. The Kris Lees trained filly had finished second at her only two previous outings at Newcastle and Muswellbrook and was sent out favourite for the 1100 metre dash with Brenton Avdulla in the saddle. The first crop daughter of Coolmore shuttler Excelebration jumped well, but drifted back to be in the second half of the big field of 16 when turning for home. She unleashed a sizzling sprint to power home and win by three-quarters of a length running away from I Am Invincible filly Born in Barcelona. "I thought she might have a bit too much to do coming from there, so she did a good job," said Kris Lees. 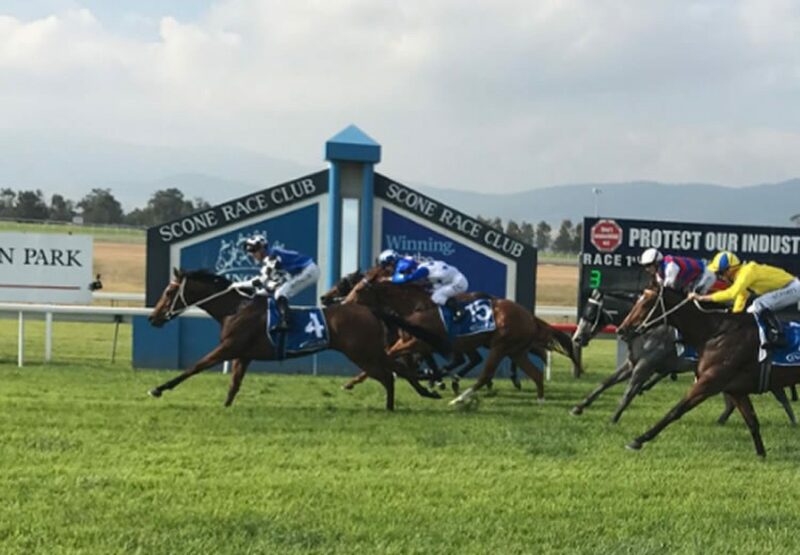 "She has a big group of owners here today for Australian Bloodstock and they found her at Scone last year and didn't pay much for her so to win a $100,000 race is a great result." Excelamour was bought by Australian Bloodstock for $26,000 from the Edinglassie Stud draft at the 2017 Inglis Scone Select Yearling Sale and has already banked close to $100,000 in prizemoney for her very happy owners. Excelamour is a half-sister to stakes-placed Love's Great and to the dam of recent stakes-winner Kobayashi and is the fourth winner from Explosive Love, a full sister to HK International winner Monopolize. Excelamour is the fourth Australian winner for Exceed and Excel's Group I winning son Excelebration, whose star UK based three year-old colt Barney Roy was second in the Group I English 2,000 Guineas last weekend. Excelebration shuttled to Coolmore Australia for four seasons, but will remain in Ireland in 2017.